Discussion in 'Axe, Tomahawk, & Hatchet Forum' started by Steve Tall, Apr 10, 2016. At the suggestion of "Old Axeman" (Bernie Weisgerber), I've started a new thread about the big exhibit that Collins & Co. had at the 1876 Centennial Exposition (at Philadelphia) which was later displayed for the 1976 Bicentennial at the Smithsonian. This post has a recap of the conversation so far, with additional information to come in later posts. ...in 1976. I was working on a period log homestead reconstruction project for the Bicentennial Commision. I had reason to be in Washington DC. One should never be in DC and not visit the Smithsonian Institution. I went in the Arts and Industries building. 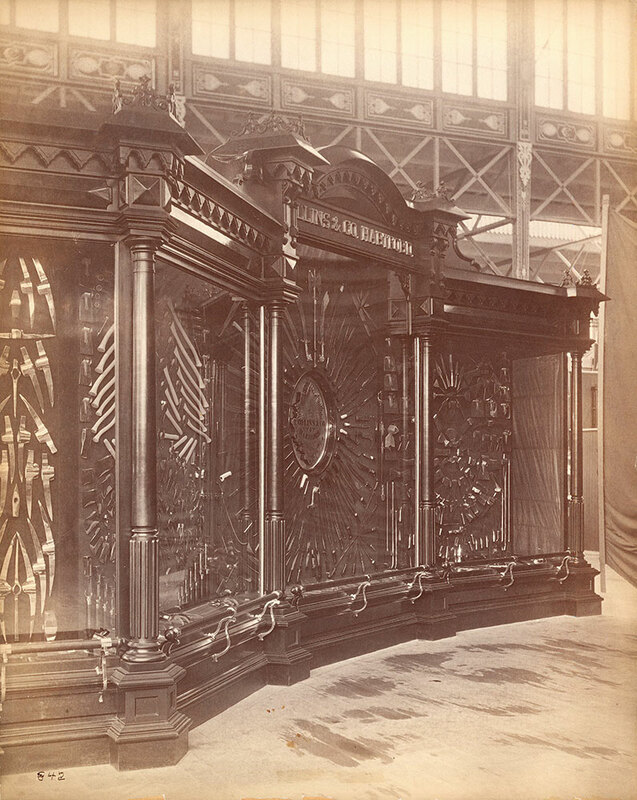 They had a display from the 1876 Centennial Exposition in Philadelphia, Pa. Collins Axe Co had some big oak display cases full of one of everything they made, all new and polished up. This display will make an axemans heart stop... I wish I knew what happened to that exhibit. I hope it is not in a Smithsonian warehouse somewhere it can not be seen. It is the best original collection of axes I have ever seen. In 2005, Lee Valley had the opportunity to add the magnificent Collins & Company display case shown below to its permanent collection. It is thought that it was originally constructed for the 1876 United States Centennial Exposition in Philadelphia, Pennsylvania. It was subsequently used in other trade shows. It remained in the possession of Collins & Co. and was displayed at its head office until the company's closing. It is filled with a representative range of the manufacturer's tools. This unique advertising cabinet is on display at Lee Valley's downtown Toronto, Ontario, store. Steve, that looks like one of the cabinets as I remember. But there are more than that, I remember a huge fan shaped display of axe heads in a cabinet. I must have taken pictures if they let me. If I did, I have moved too many times to be able to find them. Somebody, somewhere must have pictures of the entire display. Thanks Steve, I knew you would find photos. The display in that photo is the exact display that I saw in 1976. I would bet that the smaller display that Lee Valley (my favorite new hand tool supply company) now has was something that Collins had made in 1876 to put in their show room while their big display was at the 1876 exposition. That would mean that the Smithonian still has the big display. The Smithonian keeps everything I think. THIS DISPLAY NEEDS TO BE WHERE IT CAN BE SEEN AGAIN ! I was just thinking, maybe this discussion needs its own thread with the pictures that you have found ? Yankee Josh, Drum4fun and Miller '72 like this. The Smithsonian (in Washington DC) had an exhibition titled "1876: A Centennial Exhibition" which opened during the Bicentennial year (on May 11, 1976) and remained on display for 20 years (until August 10, 1996). See materials acquired from the nation's 1876 Centennial Exposition at Philadelphia, which recapture the atmosphere and spirit of the original Exposition. 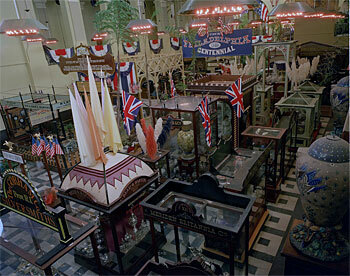 Many of the same types of objects are on view, as well as some which were originally displayed in 1876. Thanks Steve, having grown up in Philadelphia I am very familiar with that building as a child it was known as Horticultural Hall in Fairmount Park a most impressive building and still there. The exhibit of the famous Collins Company of Hartford and Collinsville in the Main Building was an attractive one, although the first thought would be that no arrangement of axes hatchets picks shovels etc could be made that would be pleasing to the eye. But the company proved otherwise and their spacious show cases radiant with plate glass held glittering designs formed with polished axes hatchets machetes knives etc arranged in circles or otherwise ornamental. These articles are known and used the world over in every section of North America. The Collins Company's trade mark is the only guarantee required by a purchaser. The settler of Australia swings a Collins Company axe and the Brazilian clears a path through his native jungles with one of its heavy machetes. As an illustration of the extent of their manufactures it may be stated that nearly five hundred styles of machetes are made. Such is also the case with axes plows and other implements for a design that will sell in one section or to one nation would not be accorded even the compliment of a trial test in another if its shape was unsatisfactory. Hence the great variety of articles manufactured the exhibit of which at Philadelphia gave a good idea of the capacity and extensive trade of the firm. Steve Tall thank you for the information on the thread. I’m still trying to figure out how this forum thing works. As stated in my first post. I live close to the old Collins Co. and have the 1876 collection. I would like to hear from anyone that has Collins items they believe come from that exhibition. I have the original Smithsonian list along with the correspondence letters. I am looking for other Collins items to add to my collection. I’m more into knifes, sword, machetes, signs, catalogs, one of a kind items, advertisement and John Brown Pikes. Other makers like Upson, Hart and Pond knifes. Unionville CT manufacturing companies. I don't know if anyone else here was lucky enough to have seen in person the 1876 Centennial Exhibition that the Smithsonian used from 1976 until 1996 for the Bicentennial exhibit. C&Co.Legitimus, I have to ask, how did you come to acquire this fabulous exhibit? I thought the Smithsonian kept all their exhibits in perpetuity? Agent_H and Miller '72 like this. Not a simple task surely...I would love to know how you were able to acquire the exhibit, any exhibit, from the Smithsonian. As a neighbor myself, grew up and still live but 20 minutes from Collinsville, I am most interested in learning more of the centennial exhibit, possibly if you would consider perhaps, to allow a viewing. C&Co. Legitimus and Agent_H like this. C&Co. Legitimus and Miller '72 like this. Forgive me if I post in the wrong area I’m still trying to figure out how forums work in general. As for the collection it was on loan to the Smithsonian and was returned. I have all the paperwork to show it’s provenance and remember it was originally put together for 1876 but went back again in 1976-on then returned. Sounds like that’s when you saw it last? Square_peg and Miller '72 like this. Remember it’s not in the display cases like when in the Smithsonian. Lol I wish. I’ve been thinking about building it but man that was one big @ss display. Remember The Smithsonian ships things in crates just like you see in the movies. I’m off to work. I’ll try to reply throughout the day. I would be excited just to see the crates lol! How do you post a pic from your own photos? You can try using this image hosting site to post pics. Cool. I’m typically up there on the weekends or driving through on my Harley. I’m obviously looking for buyers but I’m really interested in why or how people got hooked on Collins? Is there a favorite axe you collect or are looking for? When did you acquire the centennial exhibit? Did you obtain it complete, minus the cases? As I understand you are now looking for buyers to sell off the pieces of that collection/exhibit you no longer want to keep? I like all axes, hatchets, traditional hand tools. I do have a collecting bug for CT made connie patterns, Collins and Roger's of course, but New England made and other CT made axes (Connie's always) are as high on my list. Trailsawyer, Old Axeman and Miller '72 like this.